As of 2017, there exist over one billion sites on the internet. Each website has a unique URL, and for the system to work, there needs to be something that keeps track of all of them. Otherwise, we’d have thousands of duplicate domains, and the internet would be unsearchable. That’s where the Domain Name System (DNS) comes in. This system helps keep the web accessible by tracking every new domain, renewals, expirations, and more. That way, users can enjoy their favorite sites without memorizing complicated IP addresses. In this article, we’re going to talk more about what the DNS is, why it exists, and how it works. Then we’ll discuss why this is such an important system to understand. Let’s jump right in! When you register a domain name, you also create a DNS record for it. 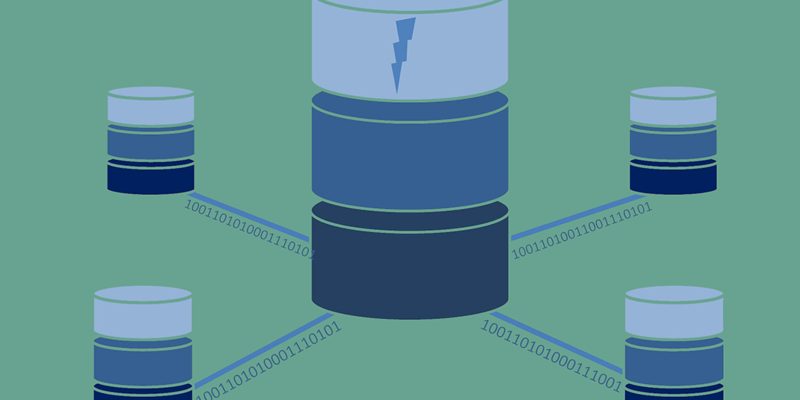 If you’re unfamiliar with the DNS, you can think about it as a system of databases. Each time someone registers a domain, a corresponding database updates itself with the relevant information. That includes who registered the domain, their contact information, the name of the URL they chose, and the IP address associated with the URL. When the dust settles, your new domain will be registered across a decentralized network of databases. Then, everyone will be able to access your site by using its URL instead of an unwieldy IP address. The DNS dates back to 1985, and it’s integral to the internet as we know it. Without it, you probably wouldn’t be able to register new URLs, assign them to Top-Level Domains (TLDs), or even find anything you’re looking for online. Every website has its own unique IP address that you can use to access it. To understand how the DNS works, we first need to talk about hosting. Each time you subscribe to a hosting provider and set up a website with it, you’re assigned an IP address. That address enables other people to access your website. The problem is that these strings of numbers don’t mean anything, and are too complicated for most people to remember. After you’ve linked your domain with your website, your registrar will save that information to the DNS and distribute it to databases around the world. This process can take time, which is why some registrars warn you that your new domain may not work for up to 72 hours after you register and assign it (although it almost never takes that long). If you’re wondering why the internet relies on a series of databases instead of having a single centralized location, the answer is that it’s all about redundancy. With multiple copies of the same information, you can be certain your domain will always be accessible. Even if one database goes down temporarily, its information will be safe, and it will update itself when it comes back online. In practice, you’ll probably only interact with the DNS on two occasions: when you register a domain and link it to your website, and when you’re transferring a URL to a different registrar. In both of these cases, you’ll want to have at least a cursory idea of what the DNS is and how it works. This will save you some time when dealing with your web host or registrar’s support team, and it’ll make you more efficient at your job if you need to manage multiple domains and sites. Makes the web easier to navigate. By assigning simple domains to IP addresses, the DNS makes surfing the web easier. Keeps a record of the domains you own. Should you lose access to your domain, it’s simple enough to prove that you own it if you still have access to the email you used for registration (even if you protected your information). Prevents duplicate domains. Imagine for a moment that it were possible for multiple users to register the same domain. The internet would be nearly impossible to use, and unscrupulous people could try to hijack your visitors. It’s a good thing we have the DNS in place to prevent this. By now, you should have a firm grasp of what the DNS is and how it works. However, if you want to read more about the technical side of this system, such as how to transfer domains into A2 Hosting, check out our knowledge base. The DNS offers an elegant solution to a complex problem – the need to keep track of every domain name and any changes that occur to them on the entire internet. It’s definitely not a small task, but the system works well and makes navigating the web much simpler. When you register a domain and link it to your website, you’re assigning it to a particular IP address. The DNS takes note of this change and stores it in various databases. The system then distributes this information, so anyone can access your website using its domain. Do you have any questions about how the DNS works or why it’s important? Let us know in the comments section below!